Siobhan Fallon is the author of You Know When the Men Are Gone, winner of a Pen Center USA Literary Award in Fiction. Her latest novel is The Confusion of Languages, which will be published in June 2017. Ms. Fallon’s work has appeared in Prairie Schooner, Publishers’ Weekly, NPR’s The Morning Edition, Military Spouse Magazine, Washington Post Magazine, Huffington Post, and others. Theatrical productions of her fiction include performances in San Francisco, Denver, Dallas, and France. She and her family now live in Abu Dhabi, UAE. Early in Sebastian Barry’s magnificent and boundless novel, Days Without End, young Thomas McNulty flees Ireland’s Great Famine: “I was among the destitute, the ruined, the starving. 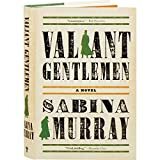 . .
Sabina Murray’s expansive new novel Valiant Gentlemen sketches a lucid picture of the British Empire from her imperialist ventures in Africa to her execution of Irish rebels in 1916. “The only thing you can know for certain in this entire book is where the body was found” speaks the Lane of Many Heads in the opening sentence of Raja Alem’s novel, The Dove’s Necklace.